As a strategic consultant and expert for digital growth Birgit Ströbel works for companies with a claim to number 1 status in the market. She accompanies and coaches managers around the topics brand positioning, vision & mission, growth strategies and development of organizations. As a truly experienced entrepreneur with empathy and fundamental know how she guarantees meaningful impact. 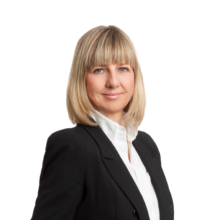 Birgit Ströbel is a certified facilitator for transformational leadership and as a business coach. In the last 25 years as manager and entrepreneur she has collected a wide range of experience in brand development, marketing strategy, company growth and organizations. She has co-founded several web portals, succeeded in developing ImmobilienScout24 to become the leading real-estate brand in Germany and developed holidayinsider.com to the leading German accommodation portal. She brings this experience to bear both in successful corporations and in fast-growing, dynamic startups, where she plays an important role as Business Angel. Birgit Ströbel is one of the 3,000 most important marketing and communication experts in Germany and has received several awards, including the European Change Communication Award for „Internal Branding“ – new brand positioning of friendscout24 – in 2012. She works and lives in Berlin and Munich.